Cauliflower is one of those vegetables that you see in the store, and you really wanna try cooking with it, but sometimes you just have no idea what in the actual world to do with it... so you just don't buy it, and you move on to broccoli or something. 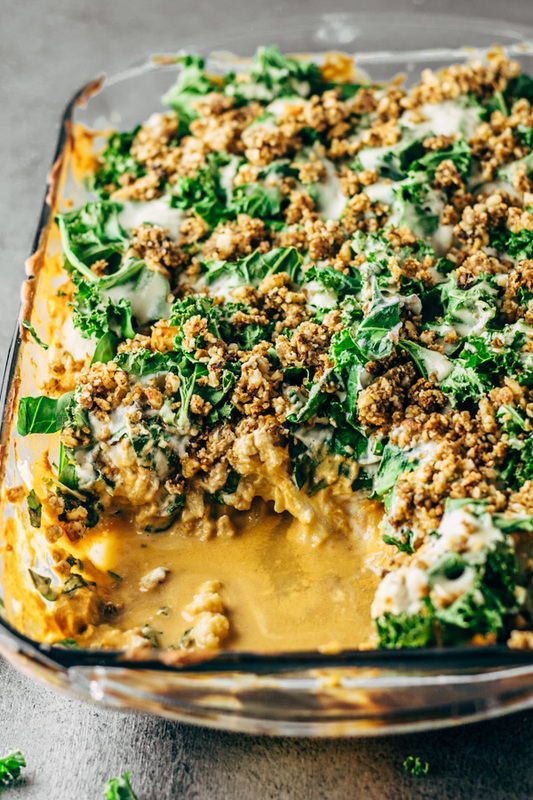 A cheezy buffalo cauliflower casserole topped with spinach and kale, that is soooo unbelievably tasty, you won’t even know it’s healthy! Vegan | Oil free | Gluten free. 1/2 teaspoon (2g) of cayenne pepper or more depending on your tolerance to spice. Cut up cauliflower into florets and bring to a boil for 20 to 25 minutes or until tender. In the meantime, preheat the oven to 350F. Make the spicy buffalo cream sauce. Mix all ingredients in a blender until smooth and set aside. Drain cauliflower florets and coat with spicy buffalo cream sauce. Place coated cauliflower in casserole dish and roast in the oven for 20 minutes. Make the vegan garlic cheeze sauce. Mix all ingredients in the blender until smooth, set aside. Chop the kale and spinach if not chopped yet. Remove cauliflower from the oven when finished and top with chopped kale and spinach, and pour vegan garlic cheeze sauce on top of greens. Place casserole dish back in the oven (on the 2nd rack preferably) and roast at 350F for another 10 minutes. Remove, let cool, and serve. I had some left over vegan sundried tomato walnut taco meat, and so I sprinkled that on top. You can find the recipe for that here. I used a 9×4 glass casserole dish. Tastes even better the next day, leftovers are perfecttt for lunch. 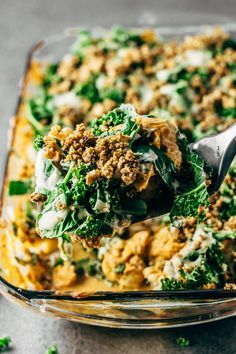 0 Response to "healthy vegan buffalo cauliflower casserole recipe"